Brian tells us about skating in New York, near death experiences and lots about Push Culture News. Get stoked! Hey Brian, where are you from? Born and raised in Texas. Spent a few years traveling Europe before settling in NYC 5 years ago. I got my first skateboard, a Nash, from my parents when I was 3 years old. You’ve been skating ever since? Yeah, there was a short period in college when I had my board stolen and was too broke to replace it but other than that brief period I’ve always had a ride. Got my first longboard in 2007. Bought it from the Sector website and headed straight to Barcelona from Texas for the summer. I like to say Barcelona taught me how to longboard. How long did you spend skating in Europe? I’ve been skating all over Europe since before I got a longboard. I used to ride my street set up in Italy as a commuter because I got tired of the public transport system. I very quickly realized that it wasn’t the optimal skateboard for getting around on cobble stone streets riddled with tram tracks. Once I got a longer deck and bigger wheels it all got much easier. I’ve been fortunate enough to have seen a lot of the major cities in western Europe by board. What made you switch to a longboard? I wouldn’t say I switched to a longboard so much as my skateboarding simply required larger wheels and a cushier ride. Where was your favorite city to skate? Best European city to skate? Barcelona, hands down. It’s like it was designed with us in mind. The city doesn’t operate along a standard north south east west set of coordinates. They built their city between the mountains and the beach. So at the end of each day I would put my board on the ground and let it take me downhill to my friends at the beach. We’d stay there till the sun went down. Who did you skate with then? Back then I was the only one of my friends with a longboard. I would skate with other people I came across on the street but like I said it was my means of transportation. I wasn’t necessarily going out to skate – I was just skating all the time, everywhere I went. When I made it back to the states my bro and his girlfriend had boards as well in NYC. When I got there myself that’s when things started coming together. Haha, the rest of my life! When I was little I never had an answer to the “what do you want to be when you grow up” question. When I started seeing a career in the skateboard industry develop it all clicked – I had my answer. It all started for me when the NYC scene started really developing. I’ll never forget the day we realized there was enough of us for a group skate. The fastest riders in NYC finally riding together faster than anything else on the streets. It was inspiring. You have a longboarding brother? You can’t possibly know about me and/or Push Culture without knowing the other Davenport at the helm of all this! My twin brother Travis is my best friend, business partner and source of inspiration. He pushes me to ride faster, but more importantly to be a better person and take full advantage of the opportunities we have to make a difference. I have a fraternal twin who skates. We’re both a little goofy I guess, but we skate regular. It was a term that was coined in NYC around the time I referenced earlier, probably 2008. In New York City, like many cities, most citizens don’t drive. Rather than riding the subway we could ride in the streets, and our commuting became a lifestyle. Push Culture described what we felt when this skateboarding lifestyle happened for us. It by no means is or should ever be constrained to one discipline or style of skateboarding. Push Culture is skate culture. All of us involved have grown in our riding and so has the term. To those of us here at Push Culture Headquarters – it’s our brand name and our brand is here to encourage and support the growth of the skateboard world including any and all flavors of riding. Like my bro likes to say – “It’s waffle soles on grip tape” – that simple. New York City – and looking to expand. What is the Push Culture brand? None of this would exist were it not for the community surrounding it, and we believe serving the community is the most important part of what we do. How many of you are behind push culture news? 4 Directly. My bro, his wife Jenica, and Joe Goodman – our friend, editor, and general TV guru. But the team of influence is ever growing and there’s no way we could do it without everyone that supports us. From the YouTube subscribers to our industry partners, girlfriends, and family. How does one tune in to the longboard o’clock news? If you subscribe to our YouTube channel (PushCultureNews.com) and follow us on Twitter and Facebook (@PushCulture) you’ll never miss an episode! How did you develop the apparel? My sister-in-law has a degree in design with an emphasis in activewear from the Fashion Institute of Technology. That provides the logistical know how for the line. We wouldn’t have been able to think about starting such a huge endeavor without her expertise. My brother’s a pretty stylish guy with years of skating behind him, the two of them together make a very adept team. All of us have been skating for most of our lives and understand what we need as riders. We are skaters designing equipment for our lifestyle, whether it be commuting to work or riding a hill. That’s the thing – we make clothing but they’re not soft goods. Absolutely! She’s on the cover of last years Concrete Wave calendar. She’s also featured in the recent SheRed Magazine. Push Culture sounds like a giant family! There’s just three of us Davenports, but like I said we have a wonderful community and couldn’t do any of it without the people that support us. What is the longboard scene like in NY? Unlike anything else in the world! Just like NYC itself – it can’t be explained – it must be experienced. There’s probably been people riding longboards in NYC since there’s been 2X4’s strapped to roller skates. I don’t think it’s possible to pinpoint when or who started it all but when I showed up it was certainly small. I would maybe see 1 other longboarder on the streets in a week, and I probably already knew him. Jeff Gaites who runs Uncle Funky’s board shop in the west village tells the same story going back almost 15 years. So the NYC longboard story today is more about the rapid growth that has happened in the last 5 years I guess. It’s crazy – now you’ll see 5 other longboarders a day, easy. We’ve seen a huge boom in Europe, how has the community changed in New York? Haha, I like to think I had a little something to do with that. My brother and I used to take about a dozen completes over to Europe at a time. We would just pack boxes full of parts and assemble them when we got there. Then we’d each strap one on our back every day and they were always sold by the time we got home in the evening. We had seen how expensive and hard to find they were, we believed we could help spread the stoke by selling boards at cost. It was a lot of work but the benefits were innumerable. As for the change in NYC – it used to kind of be every man for himself. Now you can’t ride anywhere without seeing other like minded individuals. It’s much more accessible as well. Between the Longboard Loft and Uncle Funky’s there’re two incredibly well equipped core longboard shops within a couple miles of each other. So there is more interest, more accessibility, and generally more fun to be had as an NYC rider. Do you remember any longboarders you met in Europe? Geez with whom shall I start? I guess it would have to be Christopher Vallender and Marvin Thine among many others. I once traveled to La Rochelle with Marvin and Antoine Badin in a tiny Fiat packed to the brim to deliver boards to Neway surf shop and ride with the locals. That was an amazing trip! I met Laura Hatwell and the skatefurther crew at Skaiti in early 2010. That was an epic adventure as well – my first 24 hour skate! I’ve lived in London on two separate occasions. In 4 months of skating around London every day that it wasn’t frozen or torrential downpour, I saw only 1 other person on a board – and it turned out to be a guy I knew from the states – not a local! I couldn’t believe it. It was very lonely – but that’s not always a bad thing on a board. The city has very good pavement comparatively and the drivers are all used to lots of bikes, so if you mind your manners there’s no trouble. But, if you start skating like one might in NYC, you begin to see a lot of really angry English folks. More often than not they would start honking or yelling at me for no reason other than because I was doing something they were unfamiliar with. Skaiti was at the Top Gear track. We had it all to ourselves for 24 hours. Well, us and the roller derby girls. You guys have a huge and hilarious roller derby community! How does one skate in NYC? For survival… Here’s the thing. You can ride on the sidewalk (which is illegal) you can ride in the bike lane (which is nice but it gets congested) or you can ride in the street. If you’re going to ride in the street you have one of two choices – keep up with traffic or be in their way. They’re not fond of you being in their way, so keeping up with the flow is your best bet. It’s also the most efficient way to commute through the city. You can take it easy when you’re learning – I certainly didn’t arrive in NYC and start going as fast as I do now. It’s crucial that you take it easy while you’re learning how to read the city. The pedestrians, the cross walk signals, the street lights, the other cars, the traffic patterns are all your road map. They tell you when and where to go and most of the time there’s only one fastest way to point B. If you’re committed to taking it there’s little room for error. What’s the worst possible outcome from option 2? You die. Seriously. Short of death – you get hit by a car. Happened to me and after getting tossed and flipping through the air I thought I was dead. But after realizing I can’t be dead because I’m thinking about being dead I started to wiggle my toes, check. Then my fingers, check. Then I sat up and noticed a significant lack of blood on myself and the ground – that was also a good sign. I was eventually surrounded by people and came to discover that I was miraculously in great shape. The paramedics checked me out to ensure the insides were all in the right place and the police wanted to know if I would be pressing charges against the poor guy who accidentally hit me, which I didn’t. I got up yelled at the top of my lungs with excitement to be alive and skated home. Have people have died skating through NYC traffic? I haven’t actually been to a funeral but lots of hospitals. A good friend was hit by a car in the same spot but he didn’t have my luck and was laid up for 6 months. He stayed on our couch while we nursed him back to health. I learned a lot from that experience – we really almost lost him. 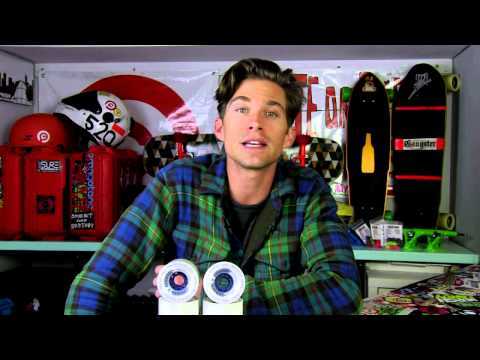 What is the Longboard Loft? A longboard shop that has has a huge selection of decks and components from across the industry. It was started by the good folks at Bustin Boards. They recognized the need for all types of longboard gear and expanded their shop from only Bustin products to any and everything longboarding. That was when it was still in Brooklyn. Early 2011 they moved to a larger space in Manhattan which I think was a catalyst for the exponential growth we’ve seen recently. At one time there was nowhere to send an interested person. Now it’s only ever a short subway ride away and once they have a board they recognize they don’t need that subway after all. Who are the folks at Bustin Boards? Ryan Daughtridge started the company years ago when he was in college. Solomon Lang is the most recognizable part of the company for sure. He’s been very instrumental in the growth of the scene. Mike Dallas also was crucial in the growth of Bustin Boards. If it weren’t for Mike there would never have been the Strike deck which was a specific turning point in the growth of the local community. What was been Mr Lang’s contribution? I don’t think anyone else has skated NYC like Solomon. For starters he’s got dreadlocks and a huge smile – so you can’t forget him when you see him. He just seemed to become the poster child for the scene. Most importantly he’s an incredible person with a magnetic personality. As people are drawn to him, he’s been able to pitch longboarding to literally thousands of people over the years. Are there many other local board companies in NYC? Earthwing has been around longer than I or even Bustin have been here. They dominate the tech slide community with riders like Steve Kong and Andriy Dash. That’s certainly not to say they’re a tech slide company. They make a board for every style of riding. The first board I ever raced downhill on was an Earthwing – it was the best race finish I’ve had to date. Do you race a lot? I wouldn’t say I’m much of a competitor but I absolutely love to race! Graham Buksa always says, “The best place to think about skateboards is while you’re on a skateboard.” I agree! And, I promise as long as I’m presenting myself as someone who knows this sport I’ll be riding. Logistically it would be easier to focus on only covering an event instead of riding it as well, but when there’s a closed road you can bet I’m skating it. It’s much more difficult to cover and race a distance event so if I ever cover an event I don’t compete in it’s distance, but I make up for it in my daily commute, I promise. Do you prefer downhill or distance? They certainly both have their own place in my heart. I haven’t used public transportation in close to a year and a half, so distance means something entirely different to me than most people. I’ve skated my fair share of all kinds of events, but one thing I will say is – there is nothing like 50 mph on a skateboard! There’s different groups of people that ride together but again NYC is a different animal – it doesn’t fit into any box. These people ride with whoever rides the same direction into the city from Brooklyn or has the same 4 hours off on a Thursday for example. In most places there is still a just a small community of riders. Here you can ride with new people every day if you want. The groups would be classified by style or location because there’re particular areas that lend themselves better to different disciplines. But even then these people probably skated there and will skate home or off to another part of the city to do a different kind of riding. How does Push Culture cover this evolution? We just show you what we’re experiencing. I’ve worked very hard to get a firm grasp on the industry and what’s happening so that we can make it easy for the audience to understand. That guy who loves his life! How close are you to being that guy? Haha, I’m right there my friend! I wouldn’t trade any of this for all the job security in the world. It feels great to make your own way. You do Push Culture full time? Is there a term for something that’s more than full time? What was your initial vision for Push Culture? To provide a source of connectivity in the longboarding world. How has PC News grown since then? We’ve become the leading video news provider in the industry by filling a niche people were unaware existed. As we have figured out what was needed and how to provide it, the response has been overwhelmingly positive. The style of the show allows for incredible freedom to cover the industry in a fun, interesting, and accessible way. Where do you see the PC family over the next few years? We plan to continue growing to include more and more Push Culture News correspondents to provide the most well rounded picture of what’s happening internationally. On the Apparel side we’re going to continue to produce innovative pieces that equip the growing rider community. What is the typical PC News report like? It depends, I guess you could divide the show into two categories: event coverage and everything else. Event Coverage is pretty straight forward. Everything else includes episodes that inform the audience about anything relating to riding ranging from “Safe Riding Habits” to “Weather Reports” where we show you how to stay skating through cold, rainy winters. Many others episodes can be found on our channel. I encourage you all to take the time to sit down and watch several episodes in a row to get a feel for what Push Culture News is all about (use the playlist features at pushculturenews.com and they’ll play right on through for you). That way you know what we’re looking for and possibly how you can contribute to the show. How does one become a Push Culture news correspondent? Think about how your nightly news gathers content. Someone in the community lets them know when something newsworthy is happening then they dispatch a news team to cover said event. Being a global grass roots style organization we can’t send someone to every corner of the globe every day, but we can utilize the potential in our viewing audience. If you do awesome stuff, are influential in your local community, posses basic video production skills, can handle yourself well on camera & want to contribute there’s a good chance we could use your input. You can contact us at pushculture.com. What plans do you guys have for this season? We have a ton of great stuff to look forward to. Our event schedule isn’t set in stone yet but we’re planning on attending Ditch Slap, Buffalo Bill, Central Park race in NYC, I Love DH Grand Prix on Windham Mountain in NY, Maryhill Festival of Speed, Winsport Calgary Cup (IGSA world championships), Whistler Longboard Festival, the IDSA sanctioned distance race in NYC, Central Massachusetts DH & Freeride, Broadway Bomb and possibly both Australian IGSA world cup events in April. That’s just what we’re planning on being at. We’ll obviously be covering all kinds of other events and news from the Push Culture News Desk as well as many smaller local happenings throughout the year. The premier DH event in America. A five day Festival of Speed on one of the most pristine roads in the country. You can watch last years coverage at PushCultureNews.com – there’s a playlist that will take you through the weeks coverage in it’s entirety and show you everything you need to know about Maryhill. It is the biggest happening in the NYC community each year. Last years Bomb saw 1,200 riders from across the globe riding together through New York City. If you want to know more about it there’s a playlist for that on our channel as well. How hard is it to produce content while not being in your base? I race all the events I cover because I couldn’t possibly stand to be there watching other people skate these perfect closed roads without me – I would hate my job! The travelling is all part of the fun. I’ve heard it said, “The world is a book – if you never travel you only read one page.” We are a very adept mobile team. We can pretty well show up with 3 people and what we can carry on a plane and produce a week worth of coverage no problem. 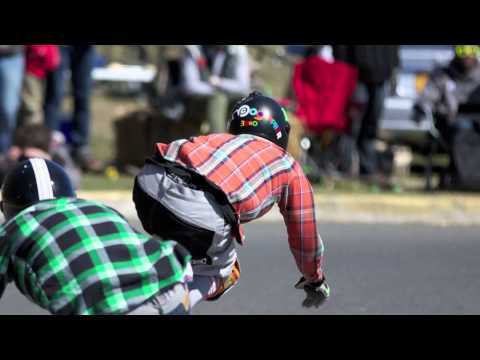 3 – What impact has longboarding had on your life? I’ve been influenced by way too much good music to say I have one favorite. 21 – Would you pick the red or blue pill? I’ll take both – see what happens. It’s been great talking to you, thanks for your time! See you at the Bomb! Thanks for the opportunity. Adios Amigo.